Plus Size Kitten: Win A Radiance Hair Gift Set worth RM350! Can't believe I'm doing another giveaway and this time it's for 11Street who graciously gave me an early Valentine's Day gift to giveaway! Looks like they're promoting their new merchant, a brand called Aperio Natural which I have never heard before until now. The branding and packaging made me feel that this was somewhat an Asian brand, from Taiwan or Japan maybe but upon further reading, it's actually an organic beauty line from a small town called Saratoga in Sunny California founded in 2008. The founder inspired by the Californian lifestyle set off to develop his own line of products using all-natural ingredients. You'll be happy to know that there's no artificial preservatives, colors, mineral oils, alcohol or SLS used in their products. Cruelty-free too! P.S: Californians love the natural environment, outdoor lifestyle, and more interestingly using natural ingredients and growing their own vegetation in their backyards to use as skin care! This shampoo has a light Cherry Blossom scent (does not last). For my long hair I used 3 - 5 pumps and it quickly foams up. This left my scalp and hair clean and volumized but in the process, it left my hair tangle, dry and stripped clean. Not the fault of the shampoo because my hair has been bleached. I felt this shampoo would be better for those without damaged hair. Aesculus Hippocastanum Extract, Yeast Extract, Algae Extract, Botanical Extracts, Vitamin B5. Apparently their best selling product. I see this being promoted on their Facebook page and it was what made me want to do this giveaway. Seriously, who doesn't want hair that's silky, smooth, airy and falls back into place after a blowout? 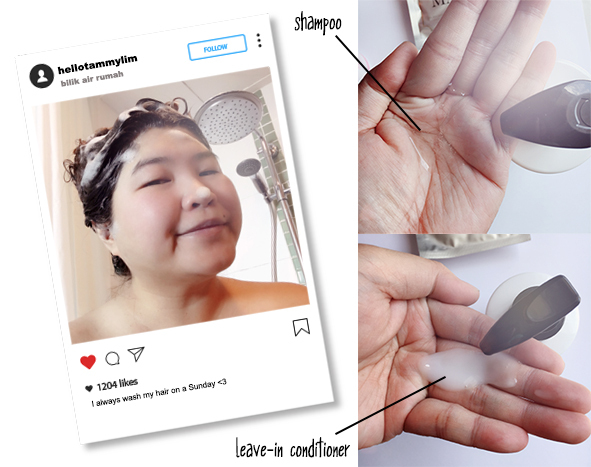 After receiving the gift, I quickly shampoo, towel-dry my hair and pump the product to smoothen my hair. I blow-dry my hair and massage it again one last time using the product. I used quite a lot of product to get the desired effect (my hair is thick and long, dry and damage so it needs more "food" haha). My hair was all over the place (tangle, dry) after the shampoo but this product pump the life back in! It detangled, made my hair soft, silky, smooth and airy. NO KIDDING. Plus it didn't weight my hair down. I am impressed with this product *thumbs up*. BUT depending on how badly damaged or colored your hair is, I feel the effect would not be 100% achieved. For me, it's 80%. What does hydrolyzed mean? It means that a chemical compound is split into smaller units. So if you see the word “hydrolyzed” in front of any of the protein names, it just means that protein has been broken down into smaller units. Hydrolyzed Wheat Protein: Water soluble protein derived from wheat, it penetrates the cortex of each strand. It strengthens and moisturizes hair, increases it’s ability to receive and maintain moisture. Hydrolyzed Silk Protein: Derived from one of the strongest natural fibers in the world. Forms a cystalline protective barrier on strands. Improves hair’s elasticity, resiliency, increases shine (silk is known for it’s ability to hold 10,000 times it’s weight in water.). The Cherry Blossom Hand Cream is a natural moisturizer which hydrates and helps softens your hands. Lightly scented cherry blossoms, with rich shea butter to moisturize dry skin. Absorbs quickly, leaving hands feeling soft, smooth and nourished. Shea Butter, Bees Wax, Avocado Oil, Tocopheryl Acetate, Aloe Extract, Honeysuckle Extract, Neroli, Sun Flower Oil, Algae, Honey Extract. THE GIVEAWAY! Now the fun part. Leave a comment on this post with your name, e-mail and answer this question where are Aperio Naturals from? This will be a lucky draw alright. One lucky reader will win this Aperio Radiance Hair Gift Set worth RM350 to flip hair this Valentine's Day! Open to readers residing in Malaysia only. Giveaway starts today and ends 11th Feb 2018. 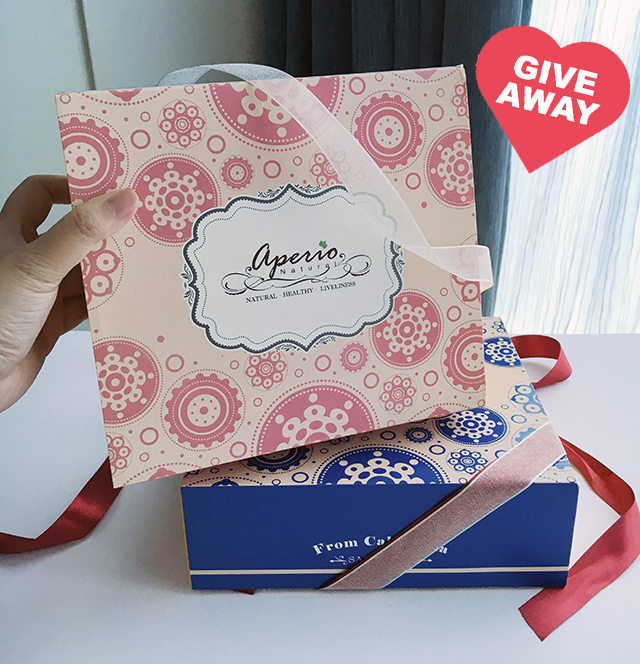 One lucky draw winner will be contacted via e-mail. I want to flip hair this Valentines too. Looking for new hair care now. Aperio Natural is from Saratoga in Sunny California! Aperio Naturals is from Saratogo, Sunny Carolina, USA. Aperio Naturals is from Saratoga in Sunny California! Answer : Aperio Naturals is from Saratoga in Sunny California! Answer: Aperio Naturals is from Saratoga in Sunny California! 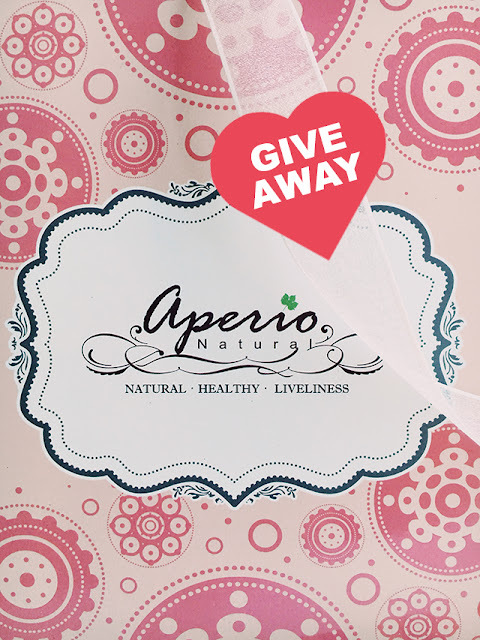 Answer : Aperio Natural is an organic beauty line from a small town called Saratoga in Sunny California. Aperio Natural is from Saratoga, Sunny California (USA)!